You are welcome to print out or download these excellent resource materials and precious dharma teachings. They may be enjoyed for personal use, for your friends and fellow practitioners, or to provide to those in prison. 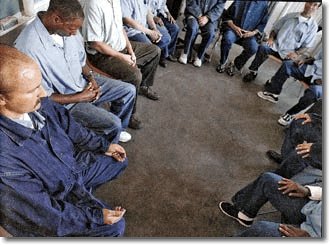 Prison outreach organizations or individuals working with prisoners, you are welcome to freely download, use and distribute our Heart of Dharma Collection of Buddhist teachings, the Glossary of Buddhist Terms, and our Resource Directory for Prisoners. You may customize the top, front page of the Resource Directory, using the name and information of your own organization or service. We would be happy to facilitate this by sending you the original Microsoft Word file or a PDF file so you can customize the document for your organization. This excellent 29-page Resource Directory for Prisoners presents an open horizon of possibility and potential for personal support and psychological/spiritual transformation. This directory offers access to Buddhist teachings and correspondence courses; Hindu teachings; yoga teachings and materials; meditation instructions; ageless wisdom and esoteric teachings; Bible correspondence courses, Bibles and supportive Christian literature; Native American teachings and ceremonial items; legal services and information; family and reentry support; counseling and drug rehabilitation services; pen pal correspondence; artistic/creative writing resources; newsletters, journals and magazines; free book services; continuing education opportunities; jobs and careers; health and nutrition resources. Most of the organizations listed in our Resource Directory offer their services, books, and literature free of charge to prisoners. This Glossary of Buddhist Terms will assist in clarifying and deepening our understanding of Buddhist teachings and terminology. This exceptional little glossary offers Pali, Sanskrit, Tibetan, Japanese, and Chinese Buddhist terms from the Hinayana (Theravada), Tibetan, Zen, and Shin Buddhist traditions. This glossary is by no means an exhaustive work, yet it does offer wonderful explanations for a wide variety of Buddhist terms and this is highly beneficial for deepening our understanding of the Buddhist path to liberation. This document is a collection or compilation of all the precious dharma teachings listed below. You may print out the entire collection with this single document, or print just the individual dharma teachings below as you wish. This is a magnificient collection of teachings! The Four Noble Truths and The Noble Eightfold Path is one of the world’s greatest teachings—the very foundation of all dharma practice. Here, in this excellent teaching, the Buddha offers us the grand possibility of bringing confusion, dissatisfaction, and suffering to a welcome end and clearly describes the Path we must follow to accomplish this liberation. This is a highly accurate and profound rendition of Buddha’s original teaching, and was edited by a Theravada Buddhist monk and scholar. Composed by the Buddhist Master Langri Tangpa (1054-1123), Eight Verses for Training the Mind is a highly-revered practice from the Mahayana Lojong (mind training) tradition. These instructions offer essential practices for cultivating the awakening mind of compassion, wisdom, and love. In just eight simple verses, this remarkable lojong teaching enshrines the very heart of dharma, revealing the essence of the Mahayana path to liberation. This excellent practice helps us purify our negativity and awaken the heart by giving us a way to transform adversity and hardship into a direct opportunity for spiritual growth. Through this practice, we transform our mind from its present confused, self-centered condition into the compassion and wisdom of a Buddha. Loving-kindness, Compassion, Sympathetic Joy, and Equanimity—are the sublime expressions of love: the essential nature and radiance of the enlightened heart. They are also known as The Four Limitless Ones, The Four Sublime States, and the Brahmaviharas or Divine Abodes. These four qualities of true love are said to be sublime, noble, and most excellent for they are the ideal way of relating with all living beings. This is a superb practice/meditation for opening the heart and cultivating bodhicitta. This Dharma teaching offers a superb explanation of The Six Paramitas: Generosity, Ethics, Patience, Effort, Concentration, and Wisdom. By practicing these six paramitas we cross over the sea of suffering (samsara) to the shore of happiness and awakening (Nirvana). Each of these paramitas is an enlightened quality or virtue of the heart—the innate seed of perfect realization existing within us. However, since these qualities of the heart have become obscured by delusion, selfishness, and other karmic tendencies, we must develop these potential qualities and bring them into expression. Most every system of Dharma includes specific preliminary teachings that serve as a solid foundation for correct perception and correct spiritual practice. The Four Thoughts That Turn the Mind Toward Dharma are the very foundation of the Buddhist path. To make progress in our practice, to attain liberation from suffering in this very lifetime, and to be able to assist the awakening of others, we need to radically shift our fundamental perception of reality. As we contemplate the Four Thoughts, we transform our mind and heart, thus bringing about this most essential shift in our perception. This profound teaching is a most exquisite and enlightened transmission of mind training (Mahayana lojong teaching)—it is a literal gem of Dharma. Every single word and sentence in this teaching is deep, rich, and vibrantly alive, fully transmitting the absolute heart-essence of Dharma. Just reading the words of this amazing teaching opens the heart and mind into greater compassion and kindness. To break the spell of dualistic perception, to dissolve the barriers in our hearts that keep us feeling separate from others, and to cultivate a deep compassion for all living beings, including ourselves, we need to meet and embrace reality in a radically new way. To accomplish this, we can use the precious heart-practice of Tonglen. Using this powerful and highly effective practice, we work directly with our habitual tendency to avoid suffering and seek pleasure—we learn to embrace all of life’s experiences with more openness and compassion, rather than aversion and resistance. For good reason, greed, hatred, and delusion are known as the three poisons, the three fires, and the three unwholesome roots. These metaphors suggest how dangerous afflictive thoughts and emotions can be if they are not understood and transformed. This is a potent Dharma teaching clearly explaining the characteristics of the three poisons of greed, hatred, and delusion, how to understand these defilements, and how to transform them using their sublime antidotes (alternatives). A most beautiful and profound sutta (sutra) from Buddha Shakyamuni regarding the very heart of Dharma: Loving-kindness. An excellent translation of the Discourse on Loving-kindness (Metta Sutta) is presented; certainly inspiring enough to read every day! In addition, the verses of the Loving-kindness Meditation (Metta Bhavana/Cultivation of Universal Loving-kindness) are also offered, along with a commentary and instructions for practicing the Loving-kindness Meditation. Karma is a very important subject, one which we should understand clearly. It is essential to understand karma as a foundation for our behavior, for our dharma practice, and for the quality of our lives as a whole. Karma is not a concept, nor is it a theory; karma is a natural law of the universe in which we live. Karma is a possession we have brought with us from the past, and one that will certainly follow us everywhere—even into the future! This excellent dharma teaching answers the question, “what is karma?” It also offers suggestions on how to change karma, and how to purify our karma using the The Four Powers of Purification. Project: World Service On the Inside inspires prisoners to participate, individually or in groups, in offering a daily transmission of The Great Invocation. The Great Invocation is a world prayer of extraordinary potency, translated into over seventy-five languages and used daily by people around the world to assist the awakening of humanity. The Great Invocation does not belong to any one group, religion, or organization. Inspired by this project, prisoners have organized small “world service groups” in a number of facilities around the country and are using The Great Invocation on a daily basis as part of their spiritual practice. Many have expressed deep gratitude for this project because they are now able to share an excellent practice for world service with their fellow inmates in a non-religious context that all can participate in. May the virtue of this service be dedicated to liberating all living beings from suffering, and to the ultimate goal of enlightenment for the benefit of all. May the precious heart and mind of compassion, wisdom, and love be generated in those who have not yet generated it. And may it increase continually in those who have already developed it.